Click on the TLPLineMorph icon in the Add-ins tab or type in the command directly in the command line. Pick a source and a target polyline and optionally adjust the progress setting to some value in the interval [0%-100%]. A morph polyline will be generated. For polylines with thousands of vertices the operation may take some time. Hit the escape key to abort an operation in progress at any time. For best results make sure the directions of the polylines are similar i.e. you may have to reverse a polyline direction if the intermediate polylines self intersect. Currently the app treats all polylines as a string of vertices ie curves are not supported. Additionally the "IsClosed" boolean variable is ignored and all polylines are treated as "open". You can easily work around this limitation by simulating a closed polyline - ie by inserting a vertex close to the starting vertex of the polyline. The app also does not support polylines with different elevation drawn in different UCS systems. A polyline object will still be generated but may have incorrect vertex elevations. 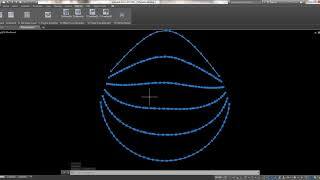 To work around this issue convert the polylines to 3D polylines. For questions/comments/suggestions/bug reports etc please send an email to Todor.Latev@gmail.com.